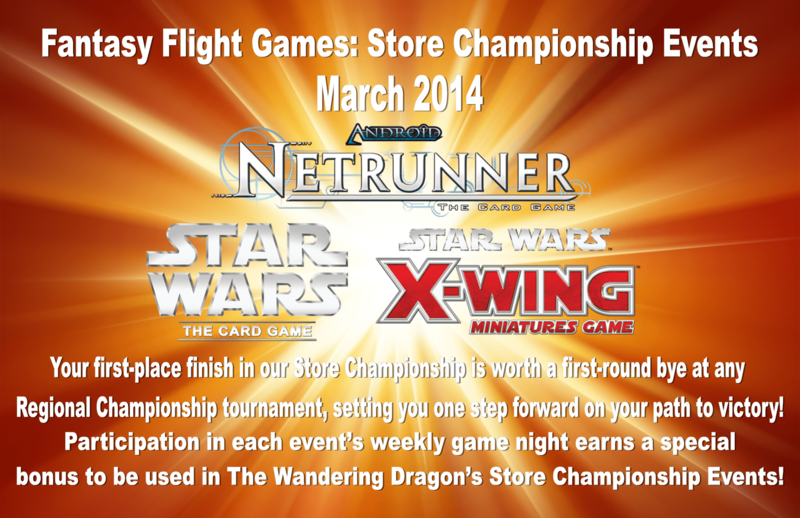 Fantasy Flight Games: Store Championship Events! 01.17.14 UPDATE: Our apologies everyone, but we will not be able to grant a bonus mulligan as we originally planned. We thought we had approval from FFG to run our variant, however we learned today there was a miscommunication and will in fact not be able to grant the bonus. Again, our apologies for any confusion this may have caused. Saturday, March 8th at 5:00pm is the Netrunner Store Championship! Saturday, March 22nd at 5:00pm is the Star Wars: The Card Game Store Championship! Saturday, March 29th at 5:00pm is the Star Wars: X-Wing Store Championship!